I don’t know about you, but with all the holiday happenings, my hot spots have been blazing out of control. What’s a hot spot you say? FLYLady would tell you it’s a place in your home where you tend to drop things and run. Unless you regularly clear these places or devise a plan for keeping them clear, you can have a hot mess. In just a few simple steps this week, we’ll take care of our hot spots. With your family, make a list of all the places where stuff tends to accumulate. In our home, that’s our entry way, dining room table, upstairs landing, and entrance to the storage area. Right now the worst is the entrance to the storage area. Work on your worst hot spot today. Declutter it and clean it. Teach the kids where to put items. Our dining room often becomes a hot spot because the kids don’t know where to put the mail that is often left there. I have been teaching them to put it in my mail slot in my kitchen. Problem solved. Need ideas for managing paper clutter? Be sure to read my advice on Davonne Parks’s blog. How can you prevent it from becoming a mess again? I have two suggestions. First, come up with a practical way to collect the clutter. For example, I repurposed a toy chest into a place for winter coats in my entryway. The kids don’t want to take the time to hang them, so I accepted that and allow them to stuff them out of sight. Do you need a basket to collect items that can be sorted later? Ask the kids and your spouse what would work and give it a try. 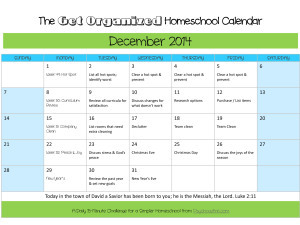 You can also find great hot spot prevention ideas on my Organized Homeschool board on Pinterest. You can always evaluate the success of your first effort at controlling the hot spot later and try something else if need be. The second suggestion I have is to make clearing the hot spot a chore that is done once or twice a day. Our entryway is assigned as a chore twice a day, for example, and these two suggestions have kept the area from becoming a disaster. You guessed it. Now that you’ve addressed your biggest hot spot, move on to the second biggest. Now you’re a pro. Clean a third hot spot and determine a way to keep it clean. 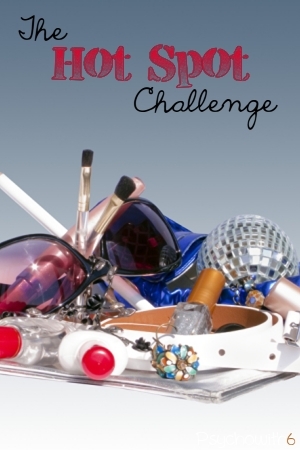 Do you have any hot spot dilemmas? Areas that you just can’t seem to keep free of clutter? I have a bad habit of doing this with my desk and with the area right next to my bed. My poor wife gets so frustrated with the piles of socks and clothes and books right next to the bed.